Samsung’s second-quarter smartphone shipments hit 76 million last quarter – up 56 percent from the prior year, and giving the company a 33 percent share of the global market. Apple, meanwhile, shipped 31.2 million iPhones, a 20 percent year-over-year rise, and good for second place worldwide. However, that trailed the overall smartphone industry, and meant that Apple’s market share fell to 14 percent – its lowest level since the second quarter of 2010, according to market research firm Strategy Analytics. “The current iPhone portfolio is under-performing and Apple is at risk of being trapped in a pincer movement between rival 3-inch Android models at the low-end and 5-inch Android models at the high-end,” Strategy Analytics’ Neil Mawston said in a statement. Overall, smartphone shipments hit 230 million for the second quarter, up 47 percent from a year earlier, and representing 59 percent of all mobile phones sold. “The smartphone industry’s shipment growth rate, which is higher today than a year ago, is being driven by surging demand for 4G models in developed regions like the US and 3G models in emerging markets such as India,” Neil Shah, senior analyst at Strategy Analytics, said in a statement. Korea’s LG doubled shipments from a year earlier to 12.1 million units, enough to give it five percent global market share and the No. 3 spot, just ahead of China’s ZTE and Huawei, each of which shipped more than 11 million smartphones. It’s an all too frequent dilemma. You get one of the best high-end Android phones out there-maybe it’s a Galaxy S5, or maybe it’s an HTC One-and the hardware is impeccable. But the software experience is all mucked up from carrier add-ons and skinning. While you can root your phone to get the true stock Android phone experience you’d get from a Nexus device, you can actually get a similar stock experience without rooting. To remove apps, the easiest way is by downloading a few Google-made apps and making them your defaults. Google Calendar, Google Keyboard, and Google Hangouts are the calendar, typing, and chatting experiences you’d get on stock Android, and they’re available for download right from Google Play. Alternatively, you can download the APK for these and other stock KitKat features here. You may’ve noticed that recently unveiled LG Optimus LTE comes with an 4.5-inch True HD IPS display with 1280 720 pixels (16:9, 329 ppi) HD resolution. The Korean company thinks they have the best screen technology in the industry, the fact that’s been confirmed by international product testing and certification agency – Intertek. Apparently, True HD IPS displays perform better than AMOLED in areas of color accuracy, brightness, battery efficiency and performance. Yes – in case you wonder – they included Samsung’s Super AMOLED Plus in the analysis as well and LG’s screen topped the chart. Anyway, we like how it sounds and can only hope the Optimus LTE will be exported from the shores of the Korean peninsula sooner rather than later. Aside from packing such a powerful display, the Optimus LTE also comes with a dual-core 1.5Ghz processor, 1GB of RAM, Wi-Fi connectivity, 8-megapixel camera on the back, front-facing camera, Bluetooth 3.0, GPS and so on. A few days back, a rumor suggested that a number of Samsung devices will skip the Android 4.2.2 Update and will be updated directly Android 4.3. It looks like the rumor turned out to be correct, at least for Galaxy Note II. 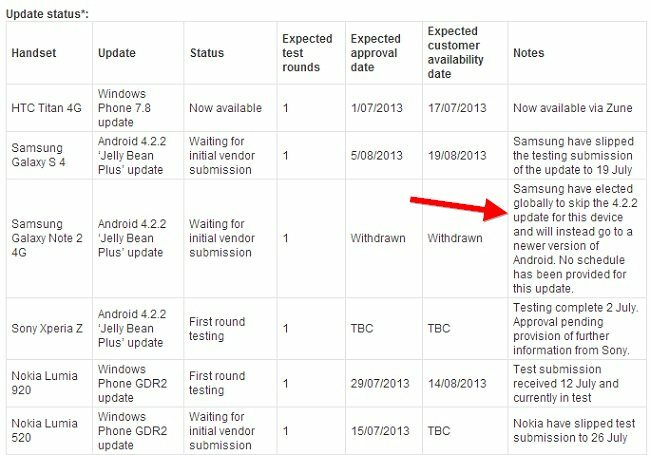 Australian carrier Telstra has announced that the Galaxy Note II 4G will indeed skip Android 4.2.2 and will be updated to the “newer version” of Android, which is expected to be Android 4.3. Rumors have it that the search engine giant will unveil Android 4.3 very soon along with the second generation Nexus tablet. Finally, we have some sort of confirmation about the upcoming Moto X. Motorola has started sending out invites for its press event that is scheduled on 1st August in New York. The not-so-secret Moto X has been the center of attraction from past few weeks. We have seen all sorts of things – images, teasers, videos and what not-related to Moto X. We have even seen Eric Schmidt using the infamous Moto X a few days back. Many Galaxy S4 users were disappointed with the fact that the Snapdragon 800 powered beast was later released for South Korean audience. If you dont know, Galaxy S4 is announced in different versions: GT-I9500 that is powered by Exynos along with GT-I9505 that features Snapdragon 600 SoC. 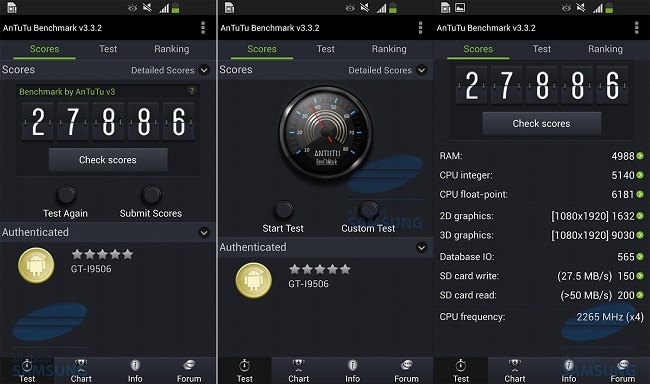 A new leak suggests that Samsung will unveil Galaxy Galaxy S4 (GT-I9506) with LTE powered by Snapdragon 800 with a clock speed of 2.3GHz, similar to the one that was released in Korea.